You are at Home Recipes Cheesecake in an Instant Pot? That’s right, you can make cake in the Instant Pot! Cheesecake in an Instant Pot? That’s right, you can make cake in the Instant Pot! If you have been following me and reading my recipes, you know I love the Instant pot! The instant pot is great for cooking food super fast and making amazing dishes like soups, pasta and now, get ready for this – you can make a cake in your instant pot! 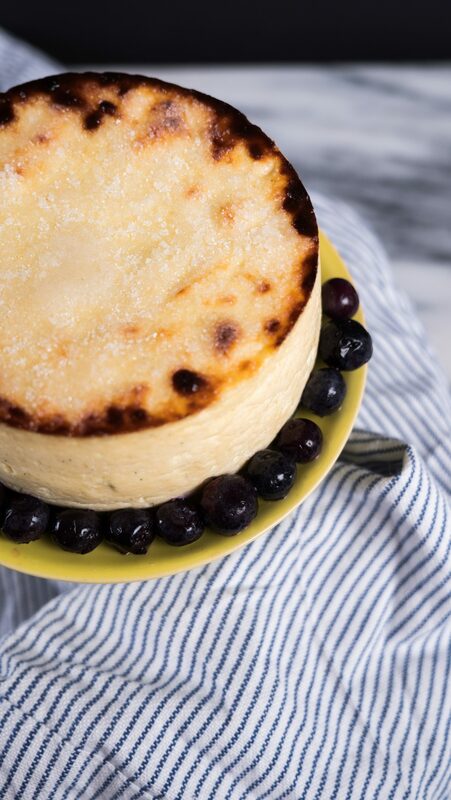 That’s right, you can make a delicious cheesecake in only 18 minutes. This instant pot cheesecake recipe is very simple with only a few ingredients needed. You can fold in berries into the batter if you like but I like to garnish with fruits at the end. You can also add a layer of sugar once the cake is cooled and create a creme brulee topping like I did, but that is completely optional. The main thing to keep in mind is that you will need to get a spring form pan that will fit inside your instant pot. Depending on which instant pot model you are using, you will need to look for a 4″ to 7″ spring form pan. (You can easily get them from amazon, link is below) If you are looking for other recipes using the instant pot, go check them out here: Chili, Butternut squash soup, beef stew, and there are more, so browse through and enjoy! I also did a whole blog post on why I love my instant pot, check that out here. Cheesecake in an Instant Pot? That's right, you can make cake in the Instant Pot!